Calendars That Help Build Timeless Relationships! Sending out calendars to your clients and other important stakeholders is a time-tested way of building and sustaining long-term relationships. It has almost become a tradition for some of the most successful and well-known brands! In addition, they ensure that the calendars reach their intended recipients on time - that is, between the last and first weeks of the transition from the old year to the new one. 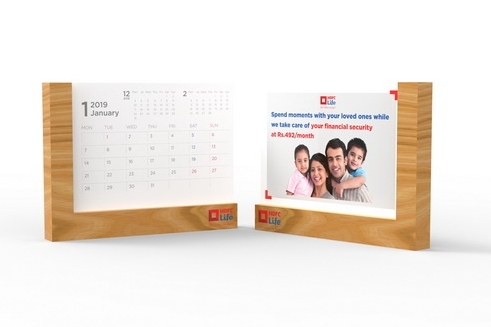 We, at Engrave Awards & More, offer unique, customised calendars, in a variety of materials! And, delivering large order quantities of quality calendars, right on time, is something we are zealous about! Take a look at our versatile range of calendars - there’s something for everybody! Here are some of our specials in a medium that’s classy, premium and timeless! The 12 leaves are postcard-sized. They can be customized with content of your choice. The pen holder is a thoughtful addition. Finally, the calendar is compact and cost effective to send out. Each leaf is the size of a post card. The clipboard can be used later to keep ‘to do’ lists. In other words, here is a design that can be used for years and years, instead of just one year. So convenient and so much value for money! A5 is the size of each leaf. The leaf is designed in such a way that it affords plenty of space to jot down important things. The fact that it is vertical allows one to print content on both sides, which is great because the person sitting across can be exposed to information about the brand that you want them to see, read, and remember. 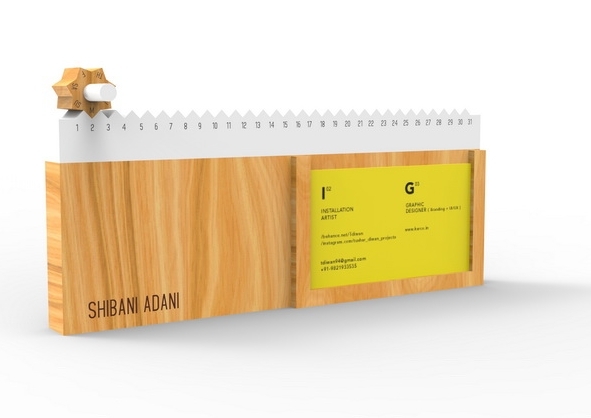 How useful is a good looking calendar that also doubles as a smart business card holder? Very, we’d say. Not only does this calendar design help you keep track of dates, days, and months, it also allows you to stay in touch with the people whose cards you kept for future reference. This is a small calendar with a big heart. Why do we say big heart? For one, it’s easy to use – the leaves are wedged into a small space and can be torn away at the end of each month. In addition, the wedge works as a fine-looking paper weight during and after the year has been done and dusted with. Finally, it’s super-budget-friendly. See, now you know why we call this calendar has a big heart. Pablo Picasso would have appreciated this calendar, what with his thing for Cubism and all. Look at it, so eye-catching it looks. And it’s not flimsy or easily breakable or anything – because it’s well made with solid wooden blocks. There is also enough surface area for branding on top. Then, each of the visible sides of the cube will showcase the months. Oh and since it’s a calendar with smoothly moving parts, it’s quite engaging to play with. In fact, it might well be a stress buster! Here are five perpetual, timeless calendars you’ll never want to change! This calendar takes the best solid beech wood and crafts it with care into work of art and utility that keeps giving, giving, and giving. Put simply, this is a very generous calendar that’s packed with beauty and brains. 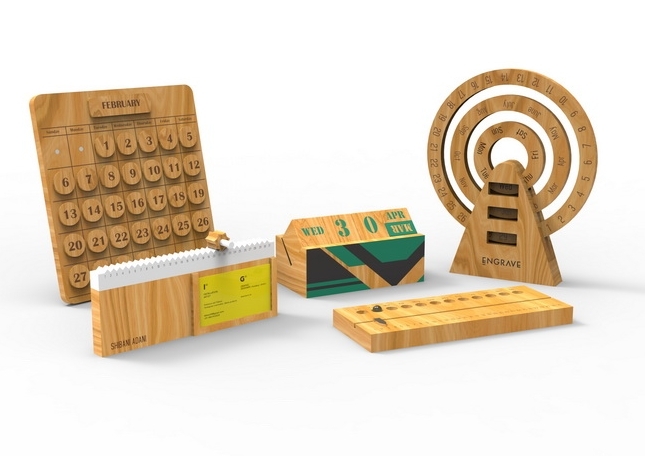 A calendar you can literally take for a spin every day sounds like fun. Well, that’s what this calendar is. What’s more, this is fun that never ends. 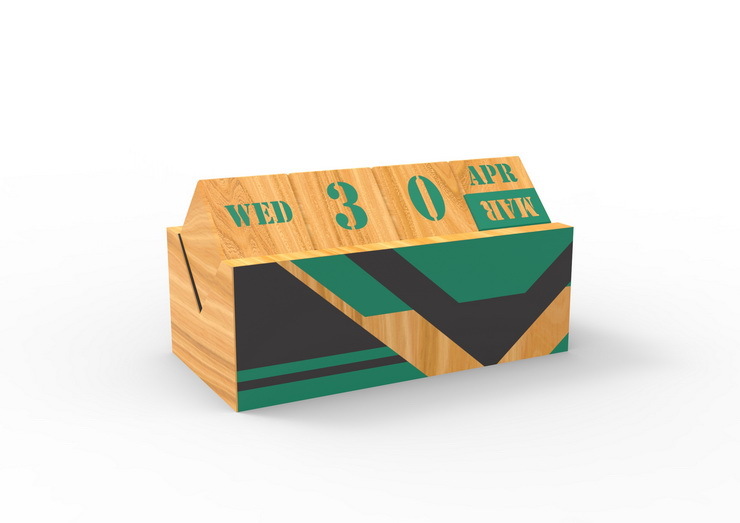 Crafted in acrylic or wood (you decide) and made for your desktop, this is a spiffy and engaging way to keep track of the days and years for years and years. 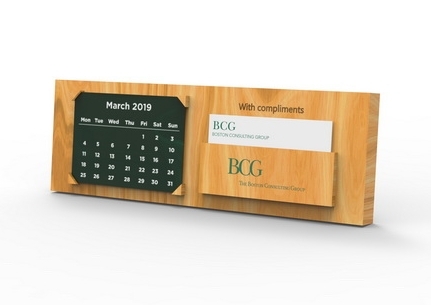 Inspired by the eye-catching rack and pinion mechanism from industrial machinery and design, this is a calendar-plus-business card holder fashioned from elegant beech wood that showcases a most contemporary aesthetic. Look at it. Doesn’t it remind you of something very European? Quite frankly, we think it makes for a very pleasing addition to any space. Everyone we know loves a compact perpetual calendar because it doesn’t take up too much space and sticks with you for good. Now, we’ve found a way to make these compact little chaps even more popular – by introducing a few innovative design touches that elevate them to a thing of handsomeness that’s distinctive, eye-catching, and extraordinary. You’ll be excused if you mistook this for an objet d’art. Actually, it is an objet d’art. It has a marble to indicate the month, a slider for the date, and an enchanting aura that will fuel conversations. Like we said, this is way beyond a calendar. A dodecahedron is a great way to bring geometry to calendars. Yes, a 12-sided figure is known as a dodecahedron, which makes it ideal for a calendar. To design one for yourself in style, customize it with subtle brand messages, and make it perfectly-sized for a desktop, get in touch with us. Notes that double as calendars are a very efficient way to run your life. Our founder has been using these desk notes for the past two months. It has made him more productive, more organized, more eco-friendly, and less stressed. All this can be a part of your life too.If you like what you see in the image above,look us up for more. 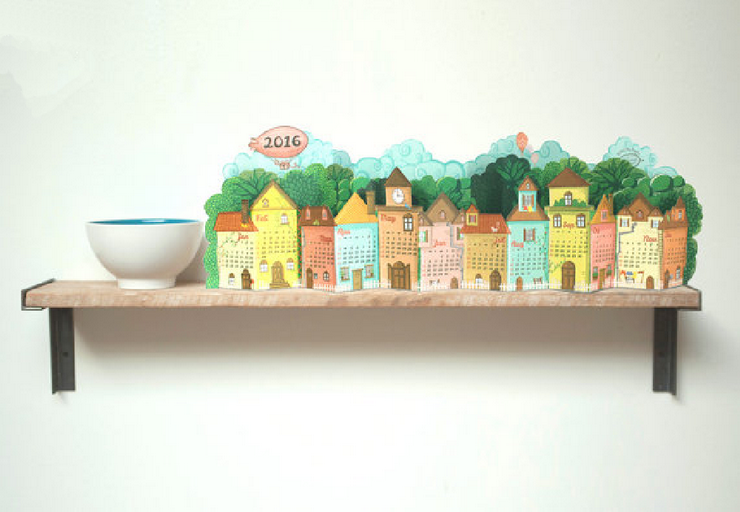 A calendar that makes the viewer’s eyes pop for all the right reasons is a desirable thing. For a memorable, engaging, and fun piece of merchandise that will be looked at every day, a pop-up calendar is the way to go. Do you have a range of product lines or themes you wish to showcase using a calendar? Yes, a calendar. Are you wondering what we mean and if it can be done? Take a look at this inventive offering from National Geographic to see an example of this, and if you like what you see, let’s talk about how we can re-invent it for you. Is there a skyline or a landscape or a formation or a scenery you love Do you wish it could be recreated in the form of an eye-catching and innovative desktop calendar you can look at every day? For example, something like the image above? Yes? Great! Let’s talk about how we can do this for your brand. As You've Already Noticed... Customisation Is Our Forte! 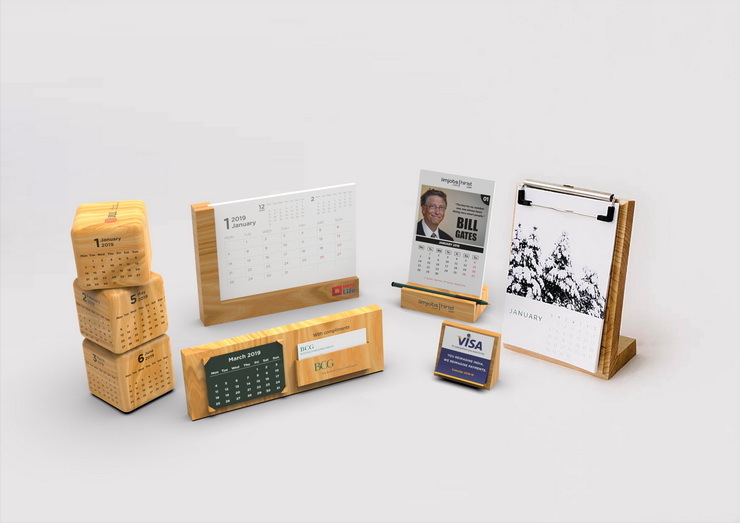 Engrave Awards & More offers unique calendars for office along with several other unique options for mementos, keepsakes, trophies, awards, welcome kits and more. All designed exclusively to suit your brand requirements!